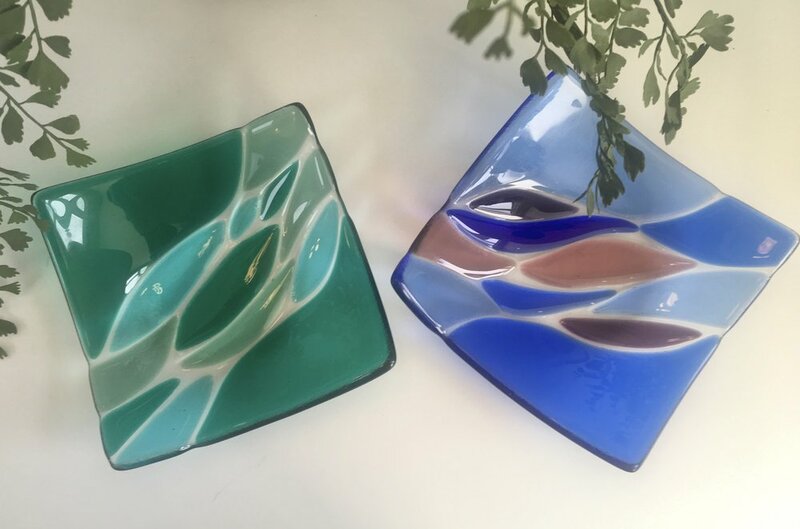 This stunning collection explores the fabulous colours of the glass and the subtle effect of laying clear over coloured glass and cutting in curves to create an elegant series of designs. The round design has been moulded in two different styles, one with a deeper bowl and a more undulating effect, the other flatter, but accentuating the curves a little more. Before it was finished into the bowl shapes I thought a number of them together would also make stunning feature display for a large wall. For the oblong platter above, I wanted to emphasise the vibrancy of these particular colours and explore how the tones complemented each other giving a sinuous effect. The meandering river effect of this teal and blue dish is created through overlaying little shards of complimentary coloured glass over a transparent base. For the small square dishes, I decided to go softer and incorporate paler colours with the flowing movements. Thanks to Jim Matthews for inspiration on the circular design.